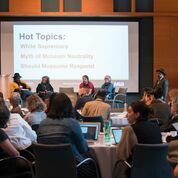 How to transform museums into places of greater inclusion and equity? This is the key question of the MASSAction (Museum as Site for Social Action) initiative, begun in 2016 and coordinated out of the Minneapolis Institute of Art. 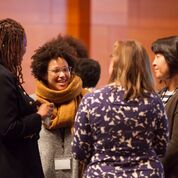 A few weeks ago 36 museums (art, history, science) from across the country gathered for the second convening, working through facilitated exercises and a tool kit for museum transformation written by those of us who met in 2016. You can find the entire tool kit and a list of resources here. There is also a Storify and a whole thread of tweets at #MASSActionMIA for October 11-13, 2017. More documentation of the 2017 meeting will be added gradually to this site. Reflections from the 130 participants are beginning to come in, and below I would like to share the thoughts of Radiah Harper, longtime senior educator, former Vice Director for Education and Program Development at the Brooklyn Museum, and currently head of Radiah Harper Arts and Museum Management Consulting. Hello warriors. Since returning home from the MASS Action convening, I’ve been thinking about the conversations, comments, and action steps we talked about during our time together. It seems to me ‘how to’ touch the humanity of this work, which is our social justice practice, is on folks’ minds. My original intent was to share this piece with the leadership circle from the other day. Today, I’m thinking there are take-aways for all of us. My goal here is to offer a way in to the question of how to decenter whiteness in the museum. My suggestions are in no way comprehensive, for instance they do not address every colonial issue like stolen cultural patrimony or the economic foundation of the museum. However, I do ask: What self-reflection is necessary to do the work of ending white supremacy in the museum? What skills do we need to build culturally competent relationships and spaces? Knowing we are the museum, here are 25 ways to check where you are in decentering whiteness or white supremacy. If the white voice has the final word in every situation, then you are not doing the work of decentering whiteness in an institution located within a global society made predominately of people of color. If the antidotes to the preceding challenges are not in your consciousness yet, explore them deeply with your colleagues and get to work. “Let us be those creative dissenters who will call our beloved nation to a higher destiny; to a new plateau of compassion, to a more noble expression of humanness.” ― Dr. Martin Luther King, Jr.
Q. What would you add? How about you? If you are reading this post by email and wish to add a comment please go to www.museumcommons.com or send a tweet @gretchjenn. Thanks.